(Contributed photo) Roger Connor, Charlie Zoch and Bill Manley called the house they rented at 822 Gaines St., Davenport, the "Haunted House" in 1960 while they were students at St. Ambrose. 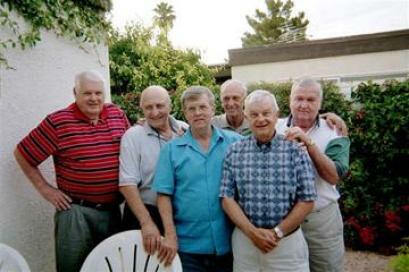 Photographed at a recent reunion are Ambrose alumni, from left: Charlie Zoch, Greg Sharko, Connor, Greg Fasano, Bill Manley and Tom Kenny. I graduated from St. Ambrose (then) College in 1960, and lived with 10 other students at 822 Gaines St., where one of the HAPPEN rehabilitations is occurring. Charlie Zoch, one of my housemates at that time who now lives in Rochele, Ill., sent me the article about our former home, known to many if not most Ambrosians of that era as “The Haunted House.” Mark McGowan, another Ambrosian, who lives in Davenport, sent Charlie the article. Many good times were had inside those old walls. I fear that we were not as studious as we might have been. All of us are delighted that the Haunted House will live on to be home for a deserving family. It is a good thing Mr. Haberman is doing with the assistance of HAPPEN.